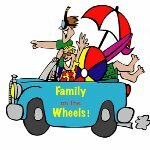 Family on the wheels (#FOTW), a travelogue of wacky explorers – Jhilmil & Chandresh. Their love for Travel can be known by fact that in a short span of 5 years they have already covered 56 cities, 18 states and 6 countries including a marathon trip of 15 days to Italy with their kid, Master Arham. The trio enjoy narrating their passionate Travel Voyages, their love for Nature & Photography.